When I was young I had a marble collection. Now I’m older, and I still like to collect marble… only now it’s marble made of wood. And it spins. On a disc. And it comes in a variety of colours and values. You use it to construct buildings in this game… this game that I just can’t stop talking about. Let me tell you about it! 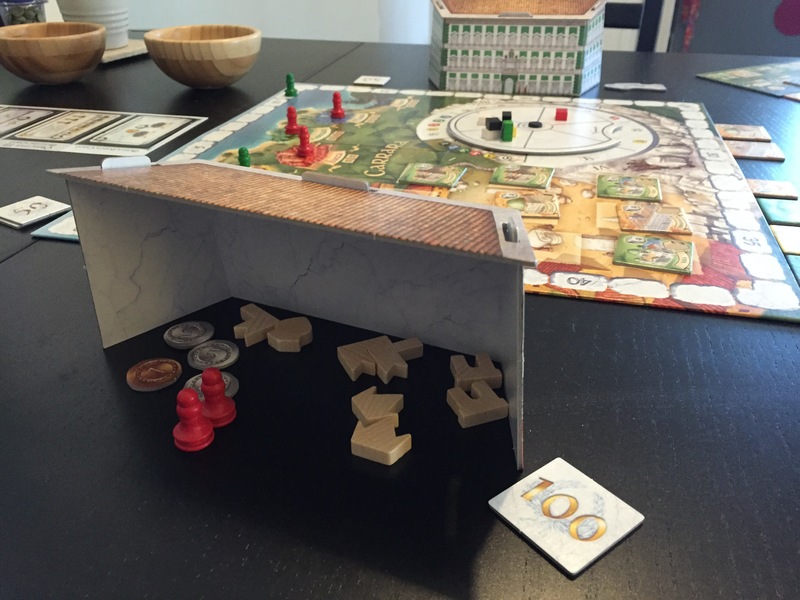 In The Palaces Of Carrara, players spend their turns performing exactly one action. You’re either collecting marble, building buildings, or scoring. Sounds easy, right? That’s what I said too! Not so fast, Vitruvius. The Palaces Of Carrara is a medium weight 2-4 player game released in 2012 by Hans im Glück in Europe, and by Z-Man in North America. It scales fairly well at the 2-player mark, retaining a lot of it’s strategy despite the lower count. It’s a set collection game game that lets playing build up cities with building tiles. It plays in about 60-90 minutes, and comes with a basic mode and an advanced game mode. It’s not often I get enamoured with a boardgame because it was nominated for an award, but that’s how I was introduced to Palaces Of Carrara. Here’s a game that would have slipped right past my radar, despite being designed by one of the biggest duo’s in boardgame design, Michael Kiesling and Wolfgang Kramer. It was the 2013 Kennerspiele des Jahres nomination it received that brought the game to my attention. Unfortunately, Z-Man lost the rights to print the English version of the game, making it hard to find (as of this writing). Because the game is mostly language independent, the German version is a fine alternative for those English speakers who are looking for a copy. Set in the famous Carrara region of Italy, the players will begin the game by buying up marble of varying quality, at varying price points. Ideally, you want to buy this stuff as cheap as possible, but as the marble wheel (a spinning rondel) gets turned by players, they’ll be making the marble cheaper not only for themselves… but for everyone! Part of the strategy of the game is knowing when to turn this wheel and when to leave it be, buying from it without invoking the discount. Once enough marble is acquired, players will refocus their attention to use it in constructing buildings within one of six coloured cities. The cheaper, slummier Lerici will let you build within their border using any of the coloured marble. The ritzy, high-end Livorno will only let you build in their digs using white marble… the most expensive and prized marble out there. Of course, the more exclusive and expensive the city you choose to build in, the better the return when you ultimately decide to score it. The downside is that because it’s so expensive, you’ll likely be less able to afford to build in it as often as in a cheaper town. Regardless, once players feel they have enough built within a city (and there’s a minimum number of buildings they need to have built to do this) they can summon the King to visit that city, letting them score points. Cities only can be scored once though!The King won’t return to the same city twice. This imposes a kind of race feeling on the game, which is likely felt strongest at the 3 and 4 player mark. At the two player mark, players have the option of just avoid each other (though not necessarily). So, you missed your opportunity to score a city. You can still use the buildings in those cities to score types of buildings, or to score a category (country or urban)… so even though you didn’t get to score the city itself, you can still design your scoring opportunities to amass you points in other ways. Three public goals are randomly pulled at the beginning of the game, and when a player has met all three of those conditions, they may call the end of the game, or they may leave you hanging for a bit longer… but who will benefit the most from a few extra turns? There’s so much goodness here. Gameplay is so simple. You have one action to perform each turn, of a possible three choices. Buy, build, or score. From this simplicity comes a game that is layered with nuance and subtlety. Setting up and early strategy is important, but being able to adjust it is also key… because your plans may not play out as you expect. The market mechanic is excellent, and the player guided scoring system is incredibly brilliant. I wish there were more games used this kind of scoring, where the player decides how and when to score, and not the game itself. It’s a euro game about city building in medieval Italy, and while that appeals to me as a theme, it’s the sort of thing that may turn some people off. 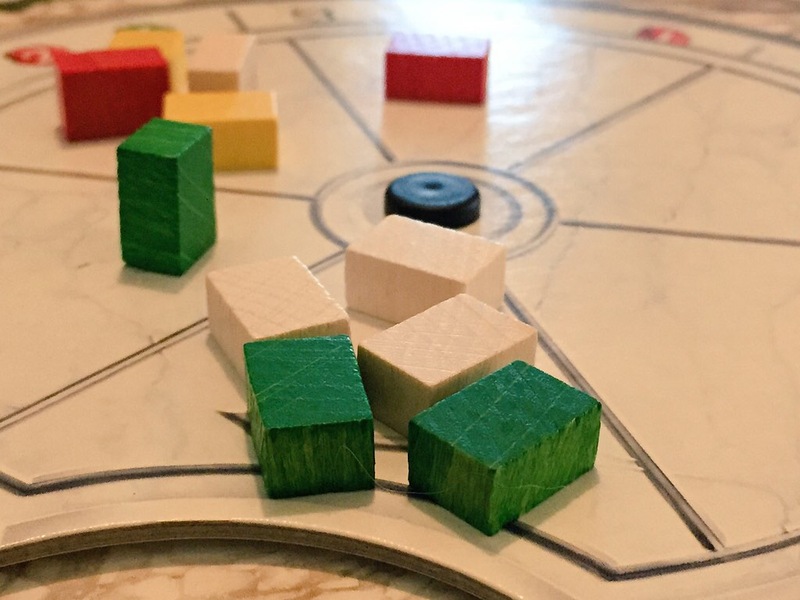 Though I enjoy the game at the two player mark, it certainly is meant to shine with three or four players – which would make everything a little tighter and more cutthroat. Some have complained about the repetitiveness of the game. I think this certainly may be a determent in the basic/learning mode, but that mostly will go away in the advanced mode. The first handful of rounds will definitely be “marble collecting” rounds, but although you will all be performing the same action during this time, there’s enough tension to keep it engaging (please don’t take red marble, please don’t take red… AH!) through this process. There is some input randomness in the selection of the initial goal/scoring cards, and in the types of marble that come out at the beginning of the game, each time the wheel is turned. There is also the “market” of building tiles that are filled up randomly as they are purchased. There is very little (if any) output randomness, although there is a big element of player uncertainty. The game relies heavily on your ability to read the situation of your opponents and calculate what they might do during their turn. 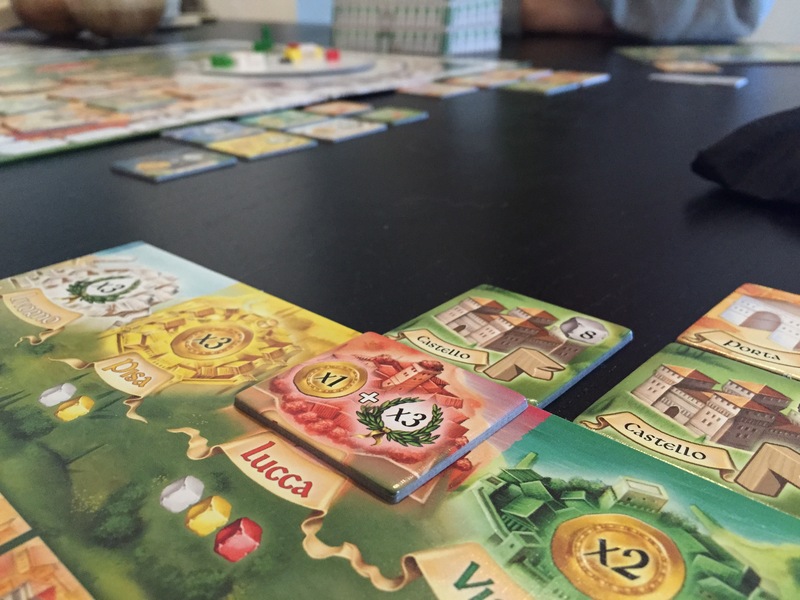 I struggled to think of some bad stuff to say about this game… mostly I have nothing but praise for The Palaces Of Carrara, a title I feel should have like taken the Kennerspiele des Jahres in 2013, despite the fact that both of the other contenders (Andor and Bruges) are fantastic games themselves. The system is solid, and based in such elegantly simple design. I wish there was an English publisher right now, but if you’re keen on the game… I would highly recommend looking at the German version as an option. The only text in the game occurs on the goal cards, which have good enough iconography that you don’t really need the text. If you do, the rulebook (which you can download from BGG in English) explains each of them in detail. I think this is one of those rare games that straddles line between the family game and something more substantial, that even heavier gamers can get into. The Palaces Of Carrara is worthy of going in to most collections. I feel like it perhaps suffers only slightly when scaled to the 2p level, but I think the replay value is high, since there’s a lot of variability introduced by the goal cards and by the players themselves.